This Lagonda V12 with factory coupé bodywork, resplendent in Prussian Blue, is a model acknowledged as W O Bentley’s last design masterpiece. This example has had only five owners, and the third was Lord Doune, 20th Earl of Moray, who used it as his personal transport before putting it in his motor museum at Warnaway Castle in Scotland. It was during his 20-year ownership that the car was changed from its original silver livery. 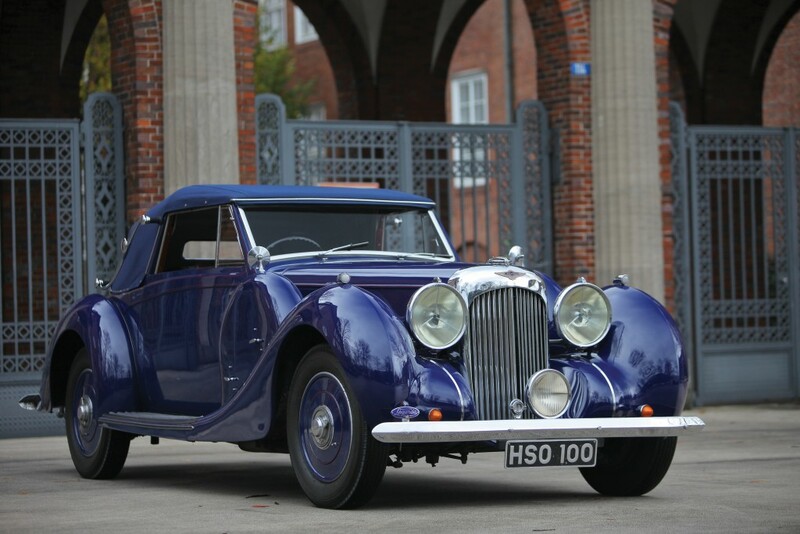 The V12 story goes back to 1935 when Lagonda, in financial trouble, was bought by solicitor Alan Good. He hired Bentley as technical director and under his aegis the all-new, aero-engine-inspired V12 was created, intended to combine limousine luxury with sports performance. Much of the detail work was done by ex-Rolls-Royce engineers. The new engine was built of chromidium, duralumin, steel, aluminium and phosphor-bronze, and every component was tested to perform under any operating condition. It had twin SU carburettors, duplex-chain and gear-driven timing and a Lanchester-type damper system. The four-speed gearbox had a centre-position gear-lever and synchromesh on the top three speeds, so it was an easy car to drive all the way to 105mph. Engine power was quoted at 180bhp; the example here has been found to deliver 195bhp. The chassis and coachwork were carried over from Lagonda’s existing six-cylinder model, but the chassis was now fitted with independent front suspension using torsion bars, plus four-wheel hydraulic brakes, greatly improving handling and stopping power. When it was launched, Lagonda announced: ‘It is a new-born car, unrelated to any yet on the road, here or on the Continent. Such is the 12-cylinder Lagonda – a car destined to rank now on, among the greater names in motoring history’. Indeed it did, but V12 production and development were curtailed by the war, and ultimately only 200 of these masterpieces were built. Around half of them survive today, none finer than this car.